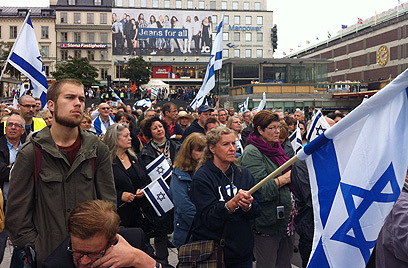 Some 1,200 people gathered in the main square in Stockholm Sunday, in for a rare, pro-Israeli rally. The rally was organized by Annika Rothstein, 31, a Swedish Jew and the author of a pro-Israel blog. Several pro-Israeli organizations assisted her in organizing the rally. Jonathan, who serves as the Jewish Agency's envoy in Sweden, told Ynet that this is the first event of its kind in seven years. "The last time we had something like this it was in a small location. This time we decided to hold the rally in a central venue. We spread the word on Facebook and through the United Israel Appeal, local student unions and the World Zionist Organization," he said. Several pro-Palestinian activists rallied nearby, waving Palestinian flags. WZO CEO Eitan Bachar said that "This is the first time in a decade that Sweden is holding any event of this kind, certainly in such a central location." Several pro-Israel activists spoke during the ceremony, which ended with the crowd chanting the Israeli national anthem, Hatikvah. Mid August saw several hundreds of Swedish Jews and pro-Israel supporters march in Malmo, in the southernmost province of Scania, to raise awareness to the growing anti-Semitism in the area. Willy Silberstein of the Swedish Committee Against Anti-Semitism, who organized the march, said that the event was impressive: "Turnout exceeded our expectations, especially when the majority of people weren’t Jewish." See all talkbacks "1,200 people attend pro-Israel rally in Stockholm "